Recent studies have shown that wolf howls have distinct identities. Holly Root-Gutteridge of Nottingham Trent University has developed an amazingly accurate sound analysis code that can tell which wolf is howling, even if they can’t be seen. Before Root-Gutteridge’s code, researchers used pitch to tell wolves apart. But the sound analysis code can pinpoint the wolf with 100% accuracy, whereas the pitch analysis only achieved an accuracy rate of 76%. Root-Gutteridge indicates that adding the volume–or “amplitude” of the howl to the code was key piece of information to increasing its accuracy. 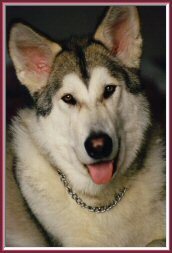 In his book “Trail Of The Wolf:, R.D. Lawrence suggests many packs like to participate in sing-a-longs. Even they like Wolf Song, he suggests. Lois Crisler in “Arctic Wild” believes wolves love a good howl and that there are many different types of emotional and vocal variations of a howl. There are happy howls, mournful howls, angry howls, soulful howls and so on. In his research, Fred Harrington found that larger wolves express themselves with deeper howls compared to smaller or younger wolves. But when adults were off hunting, pups left behind often produced short deep growls, presumably to help protect themselves against other packs. An attempt to trick any predator near by not to mess around here too long, there’s a big wolf in there somewhere. The young also must learn to howl, much like our own children. They learn to speak the language of the pack and discover the subtleties of talking with each other. They begin howling at a young age, but some researchers have suggested this is often the young trying to mimic the adults. Much like human babies do. The understanding of what they’re actually “saying” comes over time as they learn the “song”. Wolf howls can be heard up to 10 miles away in ideal weather conditions. 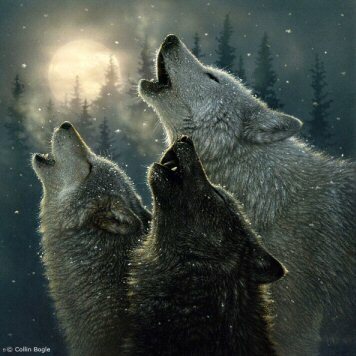 Two to three wolves can howl together sounding like 20 wolves or more. They can howl standing, seated and even lying down. Contrary to popular belief, wolves do not howl at the moon. Although it does make for a beautiful picturesque image. Young wolves howl the least during the night hours. Once again this is most probably for safety reasons. If you’re interested in following Wolves, check out the International Wolf Center. It’s really a wonderful resource for information, research and study.